Both my girls often get into reading ruts. Rut actually has a negative connotation, but I don’t really think this sort of nightly repetition is a bad thing. Occasionally it gets a bit predictable and tiresome for the reader, but repetition is a valuable early reading tool, particularly in texts that already have a repetitive structure. 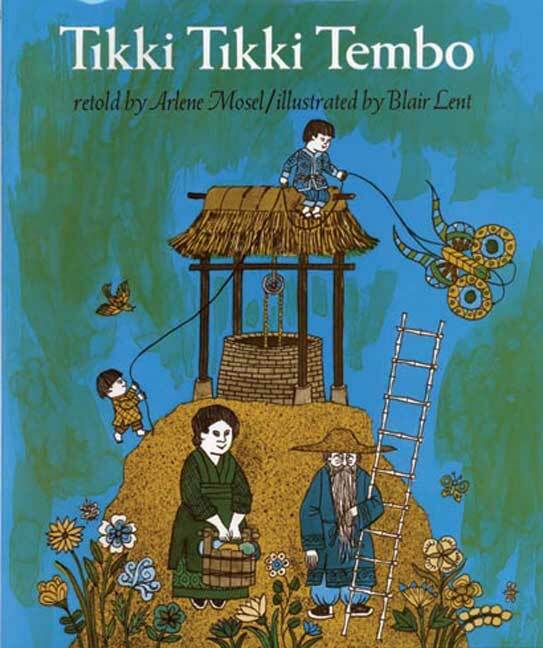 Tikki Tikki Tembo, retold by Arlene Mosel and illustrated by Blair Lent, is one of those books. The story is based on an invented Chinese custom whereby children are named in certain ways based on their birth order. The injustice of this fable is not lost on my own little one. The mother’s first born son is named Tikki Tikki Tembo-no Sa Rembo-chari Bari Ruchi-pip Peri Pembo, which (for the story’s purpose only) means “Most Wonderful Thing in the Whole Wide World”, while the younger son has a monosyllabic name that (unjustly) means “little or nothing”. Like fables do, there are lessons to be learned. Each day the children play around a dangerous object (in the case of this story, a well), and despite being warned of the danger by their mother, they fall in. First the younger son takes a tumble, leaving his brother to find help from his fairly nonchalant mother, and then from an older gentleman in the village with a ladder. “Step over step over step over step” the man heads down, and “step over step over step over step” he heads back up with the little boy in his arms. If you guessed that the young boys did not learn their lesson the first time, you’d be correct. The second slip happens with the older boy, so this time his younger brother is tasked with fetching help. Communicating the dire circumstances of a child with an extremely long name takes much more time, and as a result, precious moments are wasted in his rescue. It’s a close call, but he survives, and the ancient custom of naming firstborn children such elaborate names is revisited. Perhaps brevity (and equality) is the way to go – childhood is complicated enough without the added burden of tongue-twisting birthright issues to overcome. Regardless of the injustice (and resulting adjustment), Tikki Tikki Tembo is always a hit with kids. It’s so much fun to conquer a difficult string of syllables (like supercalifragilisticexpialidocious), and then repeat them over and over and over again. Night after night after night. Like many things, this is how we learn, and Tikki Tikki Tembo is a good book for just that.